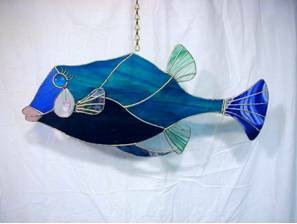 These whimsical fish will make everyone smile. Each fish has it's own personality & they can "really" swim. Their tails, fins, and sometimes their eyes move from side-to-side. 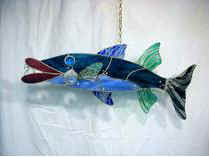 Each fish is suspended from brass chain & a marine swivel, which enables them to swing freely in the air. Eye-catching colors will always vary.